as we all know $$$ can add up quickly. The Suspension Fitness Bands by Fitness Answered are another set of products that you can add to the tool bag but won't exactly break the bank either. I've put them through a few workouts now and so far so good. 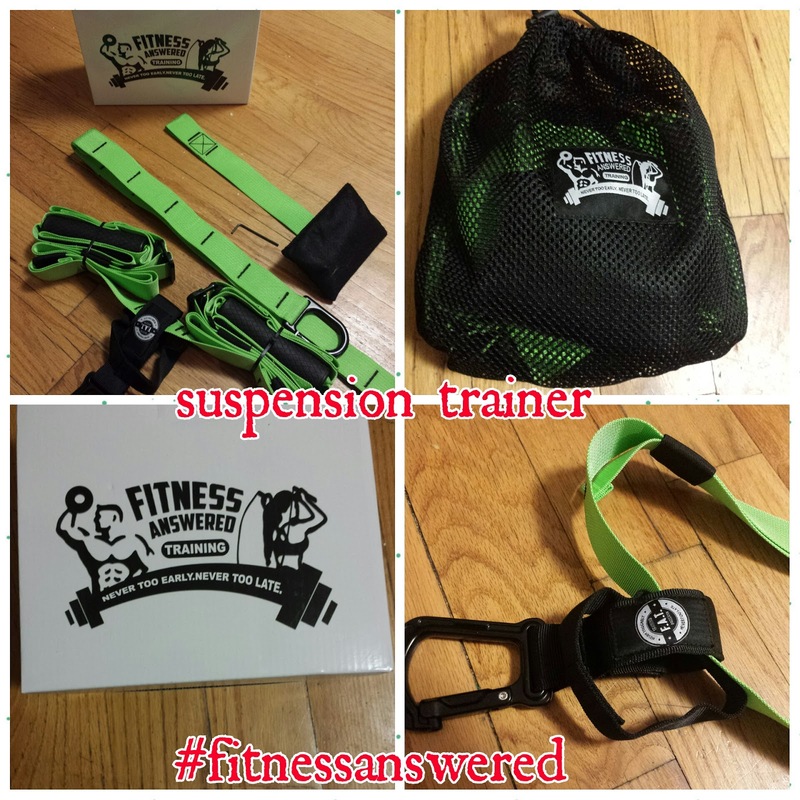 I have experience with the TRX brand, the WOSS brand, and now these. It's been a good while since I've used the TRX straps so I won't comment directly on those however vs. the WOSS brand, I will say that these seem to be manufactured a bit better. For instance, on the foot straps, these are actually lined with a bit of cushioning that just makes them a little more comfortable. Additionally, the Fitness Answered straps include the notches which indicate the correct height placement to keep your straps even when you adjust them from position to position. And though, I don't use the suspension trainers at my home, the attachment used to secure you straps to the door seems less likely to damage your door than the ones from the other brand. Thus, if you are in the market for a set of suspension trainers but have questions about which ones to get, I recommend this brand. Though they seem like a newer company, I have used there Battle Ropes, and Resistance Bands and all are living up to my expectations so far. Disclaimer: I did receive my trainers at either a reduced rate or free in return for my unbiased honest review. I love Woss and it isn't that expensive. Yeah I like my Woss one also but this one has a few more details on it as far as the cushioning in the foot straps and the length indicators on the strap that make this one stand out a bit more. But, compared to TRX's price, you can't go wrong with either! You are definitely in New Orleans, nice weather! These benefits go beyond merely the familiar ones like losing weight and getting stronger, and include all areas of your existence, including your emotional effectively being. Personal trainers create a specific workout plan just for you based on what you want to achieve. The personalized plan typically gives you better results than a general workout plan. Because he knows your physical condition and medical background, he is able to make accommodations to the program to fit your needs. To hire personal gym trainer contact with this site. This will truly demonstrate to you the best consequence of weight training and you can see the progressions of your body happen rapidly and you begin getting the huge size just by utilizing the medications of lifting weights. You can buy these medications of working out frame this site since this summitgym.net/ will give the best nature of medications for weight training. ineffectual definitions with hazy and abstract wordings, and in addition definitions containing terms which themselves require characterizing, have added to confounding the expression "Physical Fitness."